The village committee in Wang, in China’s Songyang county, commissioned DnA to build a monument in honour of Wang Jing, the scholar who compiled the ancient Yongle encyclopaedia. DnA_Design and Architecture Studio designed Wang Jing Memorial Hall. DnA_Design and Architecture’s work in the village of Wang displays great sensibility towards the historic setting, in search of an identity that may be lost but still lives on in human memory. DnA built Wang Jing Memorial Hall out of rammed-earth with concrete, just as the new architecture is grafted onto the old village centre, as if it has always been there. Wang Jing, the most illustrious citizen of the village, was an imperial scholar at the time of the Ming dynasty, appointed by Emperor Yongle to create what is believed to be the world’s very first encyclopaedia. This grandiose project is a compendium of general knowledge from the origins to the early 15th century; two thousand academicians worked on the project, producing eight thousand texts on everything that was known and had been discovered at the time in the fields of agriculture, astronomy, art, geology, history, literature, medicine, the natural sciences, religion and technology. It took Wang Jing only five years to compile all the material produced and in existence on these topics at the time into an encyclopaedia of more than eleven thousand volumes, which have unfortunately been lost (source: Wikipedia). All that remains of the encyclopaedia is a single fragmented copy, pages of which have been incorporated into collections all over the world, with the largest part being kept in the National Library of China in Beijing. When the village committee in Wang, in the hinterland of eastern China, asked the architects of DnA to design a monument to the author of the imperial encyclopaedia, they saw the community’s wish to celebrate the memory of a single illustrious citizen as an opportunity to reclaim local history. Buried under decades of industrialising policy which had transformed the urban territory, the historic town centre came to be of interest once again for its potential for redevelopment, beginning with Wang Jing Memorial Hall. Around a very ancient heart, the result of centuries of prosperity, the village grew rapidly in the twentieth century as a result of industrial growth, with construction of factories and workshops all around the outside of the town. Over the years these industrial zones had eaten away at the fabric of the historic town centre, reducing it and contaminating it with concrete residential buildings three or four floors high, burying the town’s historic centre under a cloak of anonymous modernity, according to the architects. Their research aimed to explore the historic town centre, which stands out with its small buildings in sharp contrast with the large industrial areas in the suburbs: low buildings with courtyards in between them surrounded by several houses, whose inhabitants share space and time every day. The vicinity of the low houses, the way they rest against one another, established visual unity between the roofs, creating an indistinct cloak over the buildings. Everyday spaces in semi-darkness open onto small shady courtyards: the theatres of intimacy stand side-by-side with the arena of public life, while the walls separate the spaces and provide a backdrop. Wang Jing Memorial Hall displays all the pride of a public building with its long, impenetrable walls, but the curtain of walls is broken up by lots of little courtyards, both inside and outside, creating an image of unity through the sum of the parts. The Hall, on the other hand, is a single volume, made largely out of the rammed earth used to build the traditional constructions in the town’s historic centre, but with a number of concrete parts, dividing walls and structural pillars in pairs forming 17 niches as well as the rooftop patio. The niches, forming the stations in visitors’ voyage through the life of Wang Jing, exhibit bas-reliefs sculpted with scenes of important events in his life, from his youth dedicated to study to his notoriety as an academician, his teaching career, his relations with the Emperor, his promotion of culture and his voyages, the death of his mother and his return to his village, until he was appointed to write the Encyclopaedia. The route along which the niches are arranged winds from the building’s entrance to its exit. Arranged around its perimeter to leave the central space free, the niches are meditative stops on the way that visitors travel in perfect autonomy and freedom. The traditionally dark, reserved space of the historic town centre is symbolically reproduced here, where light is filtered through a few large windows and then diffuses throughout the interior, forming channels of light where the niches vertically break up the roof. 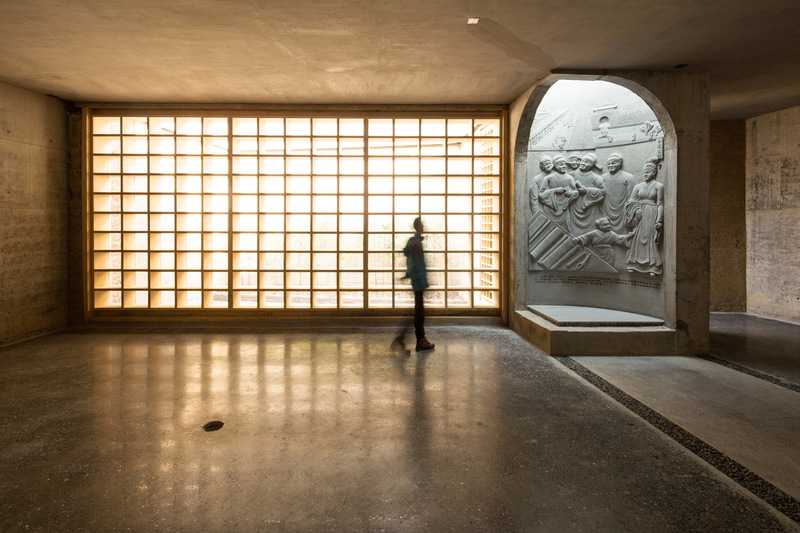 Rays of sunlight come in from above and are reflected on the pale concrete surfaces to fill all the niches, moulding them and underlining the bas-relief carvings. Light becomes a building material, a physical, almost palpable element for the observer walking along the exhibition route. On the basis of the same formal principle, in the evening electric light becomes matter and flows out of the stacks, irradiated upwards.